The Charlottesville riots resulted in a resurgence of extremist political labels. Suddenly, everyone is being called something – Fascist, Nazis, Communist. Alt-Right or Alt-Left. Labels are easily applied. They are not so easily removed. Which is exactly why the Left employs them so readily. Identity politics – pursued through a liberal media. Equally often, labels are used to hide true political intent. With this in mind, I thought it worthwhile to take a quick visit into the political spectrum. Most believe they understand their personal ideologies and grasp the ideologies of others, but ideologies are often hidden – disguised in words intended to deceive. Before we go further, I ask that you at least glance at all four charts. Each has their merits. I strongly favor the last. Many place Fascism on the far right side of the political spectrum. To those who believe such placement appropriate, I ask a simple question. How does one proceed from Conservatism to Libertarianism to Fascism? Conservatives favor smaller government, lower taxes, less regulation and greater freedom. Libertarians take this process a step further and push for complete individual freedom – as long as one refrains from taking actions that hurt anyone else. Anarchists go even further. Anyone can do anything. Period. The extreme right ends not with Fascism but a complete absence of government. In the middle there is room for debate. Move too far in either direction and debate quickly becomes impossible. Only conflict lives at the extremes. A more accurate visual representation would bend this line into a circle – with Anarchy and Totalitarianism/Communism occupying a place of mutual conflict and violence. No debate is possible in this space. Only conflict. Before folks get too riled up over either chart, note that in my opinion both are too simplistic, too linear. Each has important visual points, but they comprise elements rather than capturing the whole. I prefer the following representations. Here is the more complicated version. Harder to read – but providing accuracy in detail. I understand it appears overly busy and messy at first – but stick with it. I promise the effort is worthwhile. This multi-dimensional viewing of our political spectrum moves away from linearity, allowing more accurate ideological placement. I fall somewhere in the lower right quadrant – where the Tea Party lives. 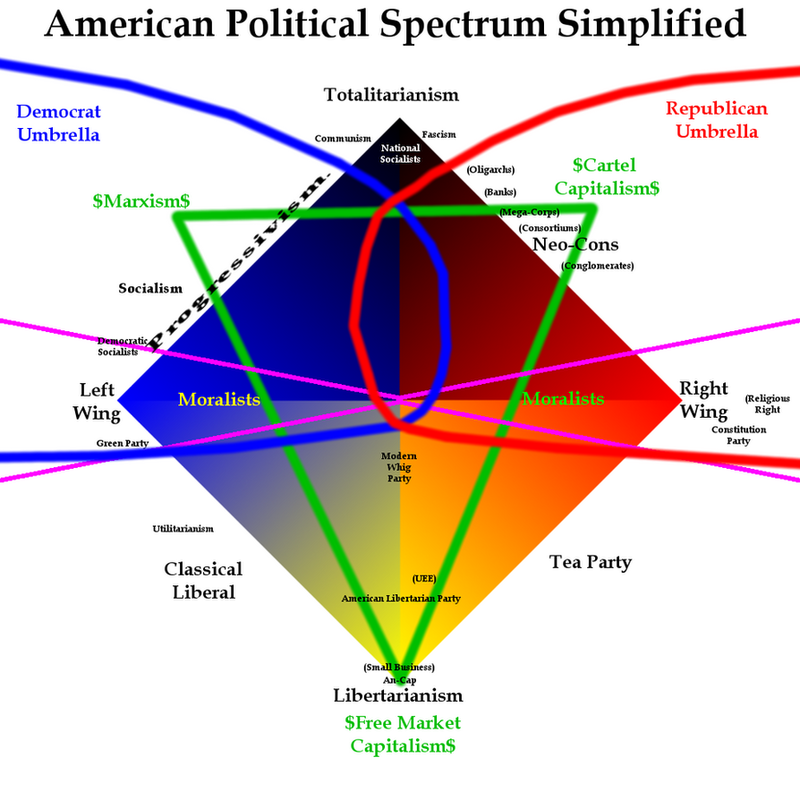 I find this chart of the American Political Spectrum to be excellent, accurate and with a small bit of study, easy to grasp. I would like to see one change made to it. Neo-Cons are really just Right-Wing Progressives and deserve to have the term “progressivism” affixed to them as well. So why all these charts and why is the fourth most accurate? With all the talk of Nazis and Fascism – along with a dose of Anarchy – I think it important to understand where one’s ideologies really exist. And where they can lead. Possibilities are many – not simply to the Right or the Left. A simple truth is illustrated in the last chart. One can occupy a far right ideological sphere – yet remain a great distance from the ideology of Fascism. The chart also lends understanding to a basic premise. Communism and Fascism contain slight variants of the same evil. Both dance equally with National Socialism. All three are Totalitarian in nature. Three groups become so extreme they merge within the same spectrum of hate and control. For the average citizen there is no practical delineation between them. Note too, the dangers of moralism comprised within the green triangle. Not personal morality. Morality as decided by some and placed onto others. A Moralist wants all others to abide by their moral code. Moralists don’t necessarily want to control the lives of others, but they insist all others adhere to their moral code, even when they do so poorly themselves. Moralists maintain a clearly defined belief of what is right and wrong. And they codify that belief onto others. Morality’s reach grows wider as one moves towards totalitarianism, then severs suddenly as all morality is lost. In this manner, morality is a tool to push conformity of belief and action – until it is no longer needed. Not all morality is Political Correctness, but all Political Correctness is guised as morality. It is the translation of Marxism from economic to cultural terms. And it leads towards Totalitarianism. Two significant groups are worth highlighting. Marxists range from Left-Wing Moralists to Communists. They are defined by the elements of Marxism. They believe in a Welfare State and redistribution of wealth. They promote Social Justice and inhibit Free Speech through the application of Political Correctness. They believe in higher taxes and engage in taxation to obtain goods and services from others using the government as conduit. They are against free markets and believe the economy can be controlled through legislation and regulation. They elevate the group over the individual. They perceive international law as superior to national law. Social Globalism through Centralized Government is a goal. They are essentially the ones in charge of the Democratic Party. And they are why the Democratic Party is in such disarray. Neo-Cons range from Right-Wing Moralists to Fascists. Neo-Cons are pro-interventionist and view America as the World’s Policeman. The roots of neo-conservatism trace back to liberal political leanings. The original Neo-Cons were moderate or Hawkish Democrats who became disenchanted with socialist tendencies present in the Democratic Party. They engage in what the chart denotes as Cartel Capitalism. Economic Globalism. Neo-Cons are pro-Corporate America – at the expense of small business. They’ve overseen the growth of Centralized banking and dominant multinational corporations. Neo-Cons are willing to sacrifice citizens civil rights through increased governmental oversight in the name of safety. Globalism achieved through Globalization is a goal. They are essentially the ones who had been in charge of the Republican Party post-Reagan. The Tea Party came into being when true Conservatives finally revolted against the Neo-Con movement. Neo-Cons are in part why President Trump was elected. One final note. Go back and look at the “political umbrellas” of Republicans and Democrats. Both groups have drifted towards Totalitarianism and now reside primarily in the upper two quadrants of the chart. An individual once deemed “middle of the road” might now be seen as an extreme member of either party. That’s an indication of how far things have degraded. With the election of President Trump, the red “Republican Umbrella” has moved down somewhat from its current placing on the chart. It needs to move more. I encourage you to use this chart. Not only to place your own ideology, but as a means to identify the ideologies of various political figures and factions. Determine for yourself where they fall – and ignore any labels they may have given themselves.